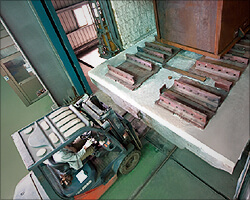 We provide our customers with in-house manufacturing from start to finish. 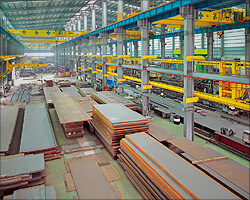 Majority of LCM's Material Inventory is sourced from Taiwan, Germany, and Japan. LCM Hydraulic Presses are equipped with variable displacement Bosch Rexroth Pumps and Teco Westinghouse High Efficiency Motors. High Quality, Seamless Tube or Forgings are used in conjunction with high quality Pistons for the manufacture of Hydraulic Cylinders. 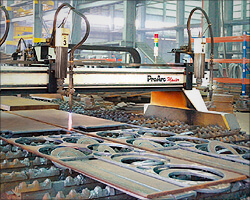 NC Flame Cutting Machine with Table Area 12,000 x 3,400 mm. 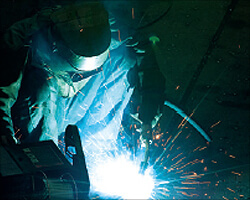 Metal Inert Gas Welding (MIG) is used throughout the fabrication of the Press Structure. Tungsten Inert Gas Welding (TIG) is used for the manufacture of high pressure Hydraulic Piping. 160 Metric ton Gas Annealing Furnace with 12,000 x 5,000 x 4,500 mm Table Area and a maximum Operational Temperature of 950 degrees Celsius. Precision CNC Boring Mills with 200 mm Spindle Diameter. All LCM Hydraulic Presses are assembled in-house. Press Assembly Area has an Overhead Crane Capacity of 160 Metric Tons with a Floor to Crane Hook Height of 14 Meters. The latest Press Assembly Area has an Overhead Crane Capacity of 400 Metric Tons with a Floor to Crane Hook Height of 16 Meters. Conforms to CE, OSHA, ANSI, JIS and N-12 Electrical Safety standards. Prior to shipment LCM Customers are invited to the Manufacturing Facility in Yang Mei to witness Press Inspection, Run-Off & Initial Acceptance Programs.